If you know me in real life and have known me for awhile, you know this about me: I have a tendency to get really into things for a really brief time, and then I move on. Some of you have been with me long enough to have seen the break baking phase, the cigar collecting, the online support group dedication (13,000 posts in 100 days of quitting smoking–I was 100% dedicated to quitting smoking), running, drumming, swimming, and the list goes on. When I was getting ready to move to Baltimore, I was in a read–everything-about-the-sea phase, and I was pretty sure I had to learn to sail if I was ever to truly understand how America happened. And Baltimore was one of the largest seaports in the US for a very long time, and still the second or third busiest in the Chesapeake. I mean, I was headed to the Greatest City in America, and they had a public sailing center and a kayak club that would affordably allow me to get myself on the water and engage the maritime life that I had decided was pretty much the most important part of our history ever; I also tend to the hyperbolic. And then I got here and got distracted by oh, I don’t know, having a new job and getting a new bike and deciding that learning all about the War of 1812 had to happen before anything else. 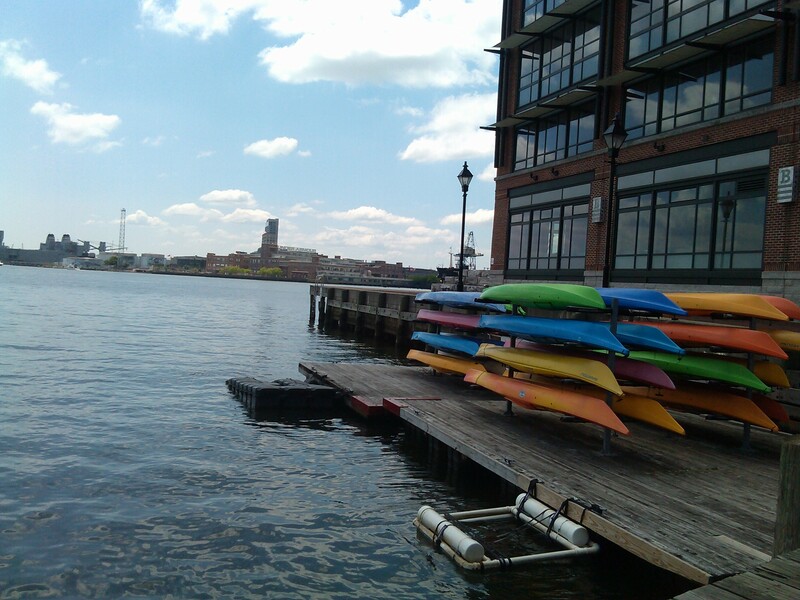 Then on a bike ride down to Canton and a Harbor Circulator ride across the water to Locust Point, I saw the kayaks and remembered, joined the club, and on Saturday, found myself riding down to Fells Point for a lesson and a membership card–now that’s the stuff. The six of us gutted through M.’s safety lesson–important, yes, but in the way of our getting in the boats–and then we strapped on our Personal Flotation Devices (that’s what we sea people call life jackets), stuttered into the boats, and we were off to try our front sweeps and pancake paddles or whatever that side stroke was called (probably “side stroke,” right? ), and learned to paddle into the break instead of away from it. The most important lessons I learned were to bring water and snacks, get a dry bag, and if you feel unsteady and like you’re going to tip over, take a stroke. Sounds like a good general rule. We were out for about five seconds and my arms were already so tired that getting out of the kayak and back on the dock was like beaching myself. M. even said to the group of my dismount that I provided strong evidence that “You don’t have to be graceful to exit the kayak.” Nope, you sure don’t. And then I was back on my bike and headed slowly up the hill, reminding myself that there would be cold seltzer at the end of the ride, just keep pedaling. A whole summer of bike rides to the harbor for a quick paddle around to see the sights from the other direction? Yep, best life now. This entry was posted in parks, personal, safety and tagged Baltimore, Canton Kayak Club, Fells Point, summertime. Bookmark the permalink. You can never have enough dry bags according to Andrea though she usually uses a raft [aka pontoon boat]. She has actually done the Hell’s Canyon run. That is badass for sure. BTW, you are not clumsy. Just hand problems which I have too.